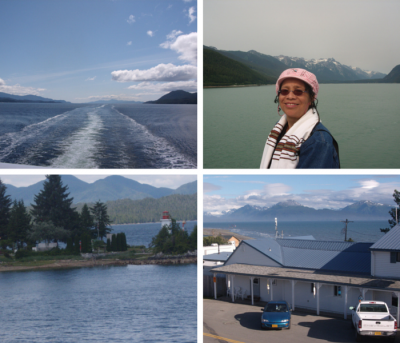 Yesterday, July 18th, was our second year anniversary of living in Homer, Alaska. I’ve shared some of our experiences in past blogs. But, since I’ve been on a minor hiatus of posting, I felt this would be a good way to return to consistent communication. Every now and then, I’ll share reflections written during our first few months acclimating to Homer. Join me in this journey down memory lane. I’m sitting on the floor on top of our thin mats and sleeping bags in our new tiny bedroom. Although this apartment is much smaller than our Hopi home and requires storing more furniture than we originally planned, it has a charm both of us like. It does feel like home. I meditated a brief time this morning and quickly heard the sound of silence. We do love Homer, people are friendly, the arts community is welcoming. Met the executive director of the Homer Arts Council yesterday at the Street Art Fair. She didn’t introduce herself as we talked, but told me to call her if I wanted to story tell and gave me her card. The Council has a new Artist Registry, she told us to sign up. The art work, knitting, jewelry, egg carvings, tie-dyes in the Street Art Fair booths were all well done and some quite exquisite. Grocery shopping is a challenge. Food costs almost twice what we paid in Arizona, and the fruit not as good looking. But, I did get a bag of cherries, some juice, frozen vegies and fish. Went by the Department of Motor Vehicles and found out I have to take a written test, so I’m reading the book. It’s really a good review, although a lot of drivers don’t follow the rules. I’m so happy to be off the highways, the curves were killing me, particularly descending curves. The drive from Anchorage to Homer was interesting. It included a long 50 mile drive weaving around a body of water called Turnagain Arm, a narrow branch of Cook Inlet. I do feel we are at home. Work may be a challenge, but I think it will be o.k., once our bodies get adjusted to this new climate and these daylight nights. I’m grateful to be here. Rigzen! I was just thinking about you yesterday–for what reason exactly I’ve forgotten, but no matter. It’s great to hear from you, and welcome back to the blogging world. I’ve been on hiatus myself, especially since my baby boy was born (12 June)! It’s always nice to take little trips down memory lane, and I’m so glad you’re feeling at home in Homer. Hope you’re doing as well as you seem to be. All the best! Ian! So good to hear from you. Congratulations on the birth of your son. You’re entering a new realm of life, fatherhood. Enjoy it – especially these baby days. Believe me, they will go quicker than you think – especially now. Thanks for commenting and staying in touch. A fascinating glimpse of life in a place far away from my home. Daylight nights must be strange. Do you see the northern lights up there? We don’t get a good view of the northern lights. Some say they’ve seen them, but I haven’t yet. Same here with the very few times the auroras over antarctica are visible here. I live in hope 🙂 I sent you an email with the eBook attached. I hope you can download it somehow. My technical knowhow is limited. Glad to hear that you’re settling in your new home. Homer sounds nice. Watch out for moose!! Thanks, Heather. Happy to hear from you too. Very nice…makes me (almost) miss the tiny town I grew up in. The food is very expensive; the only upside is the ability to get fresh seafood any time of the year. Yes, food and everything else is expensive in Homer. It’s beautiful but don’t know how long we’ll stay here. I remember when you moved to Homer, Alaska. It was 6 months after I had arrived in Australia. You were beginning a great adventure. Great to read your visit down memory lane. Joanna, thanks for dropping by. Your life in Australia seems to be constantly blooming too. Two years, seems so much longer. How’s Summer going, Sky? Funny, it seems so much shorter to me. Summer has been too cool and too short. Already daylight is decreasing. We had a 6.3 earthquake last night. No damage or injury but makes one reflect on why are we here? Thanks for asking. I’ve been disassociating myself with time and just indulging in what ever season it happens to be without counting or measuring them. Good to hear all is okay after the quake, Sky. Location awareness, a planet that continues to change and grow is far better than one humanity has abused or over tamed. In the past earthquakes perhaps did not cause as much devastation on a more mobile humanity that had a different awareness to us today.